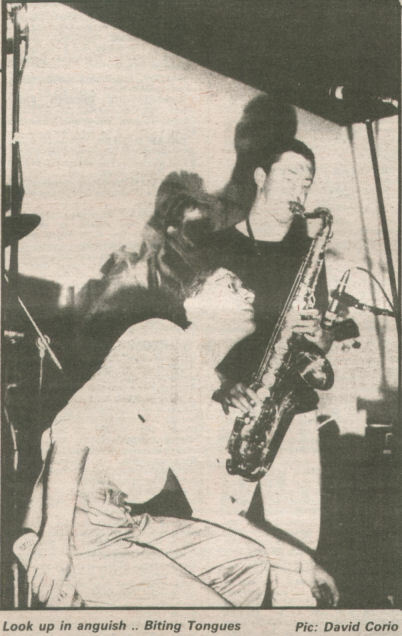 NME, March 20th 1982, "Gnashing And Wailing - The Biting Tongues, Beet Bop Club "
than he described them. Say "sorry" in here for spilling someone's drink, and they either glare at you like you're some passing leper, or take it as their cue for the kind of clever-dickhead humour that puts pleasant people right off going to art school. The level of organisation in this slummer's shrine reaches similar depths to the sociability of its patrons. A state of confusion apparently caused by the attendance of a London Weekend Television film crew (gathering footage, I'm told for a 20th Century Box programme about the 'New Jazz Scene'; hours of fun await you, Danny Baker) causes nothing at all to happen for nearly two hours, except that Gorp tune up; "really good", announced some pillock. Laugh? I nearly caused a flood. And, Lo! Gorp did play. A stumbling muddle of suits, stubble and silly beards, Gorp took some eager stabs at improvisation. They do have some idea. Using backbeat, saxophones and voice, they at least acknowledge that people are stirred by a beat and moved by a tune. No doubt this condemns them as screaming reactionaries. Compared to what came next, though, Gorp are the Second Coming. I am one of those hopeless straights who can't see why two-bricks on a cushion is a Work Of Art. Two old bricks on a cushion can, however, be relied upon to keep quiet, and hence are vastly preferable to the dismal jumble of screeching noises, tortuous groans and can-thumping which Sulphur Of Lions (amazing name, chaps) preciously trotted out. Furthermore, enigmatic hopping beneath a Terry Hall haircut does not in itself count as subversive individuality, or similar drivel, in any way at all. The real purpose of Sulphur Of Lions is to be heard making smart remarks in posh voices, after they've finished their set: "they just didn't know how to take us, did they Crispin." Insignificant twerps to a man. Camera subjects and main attractions are New Hormones outfit The Biting Tongues. At last, something I could relate to. Why, only this morning, I myself was stumbling about making angry noises with kitchen utensils. I conceptualise this process as the 'Scrambled Eggs And Coffee Notion'. It is deeply satisfying, but I generally keep it to myself. By now the place is packed with preening 'drop-outs' and maybe some of them noticed that with a bit of unfashionable self-discipline and purpose, Biting Tongues could make a decent disc or two. (I was a bit unkind back there). Alas, though, their impact was rather diminished by their anguished vocalist not noticing that his microphone didn't work. And the dense percussive weave they sought was severely disrupted by the sheer confusion wrought by all that spontaneous instrument juggling. What can it mean? No doubt certain Beet Bop clientele imagine that their ritual hanging out in hovels indicates a thorough rejection of conventional behaviour. I'd say that the practice of reverse social-climbing is, and always has been, the very clear pursuit of the terminally bourgeois. So shove that up your trenchcoat.